Republican Debate: Take Two | Kid Reporters' Notebook | Scholastic Inc.
Top Republican candidates debate the issues on September 16 at the Ronald Reagan Presidential Library in Simi Valley, California. Wednesday was a big night for 15 Republican candidates who took the stage at the Ronald Reagan Presidential Library in Simi Valley, California. The candidates were divided into two groups based on their standing in national polls. Issues discussed included the economy, immigration, and national security. Each candidate described how these matters would be handled if he or she were to win the Oval Office. With the presidential election more than a year away, intense interest so early on has taken many people by surprise. 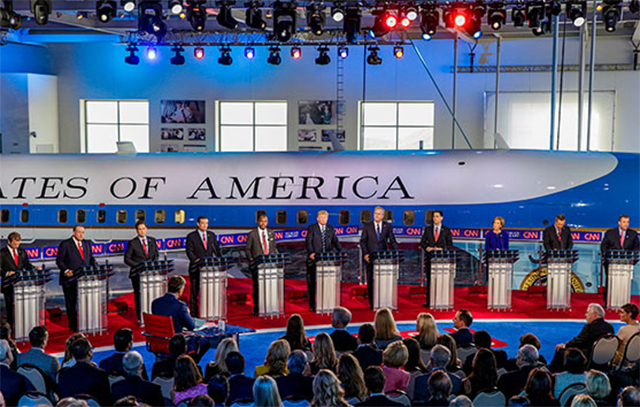 The debate featuring the top 11 candidates drew nearly 23 million viewers. Behind the scenes, this reporter watched with an estimated 800 other journalists. All eyes were on front-runner Donald Trump, a real estate executive who also hosted The Apprentice, a popular reality-TV show. Trump faced off against former Florida Governor Jeb Bush, Wisconsin Governor Scott Walker, former Arkansas Governor Mike Huckabee, retired neurosurgeon Ben Carson, Texas Senator Ted Cruz, Florida Senator Marco Rubio, Kentucky Senator Rand Paul, New Jersey Governor Chris Christie, Ohio Governor John Kasich, and former business executive Carly Fiorina. Trump has made reforming the immigration system a central part of his campaign. He says that if elected president, he will deport 11 million to 12 million undocumented immigrants and build a wall along the border between the United States and Mexico. "We have a country based on laws," he said during the debate. "I will make sure that those laws are adhered to." Other candidates are skeptical of Trump’s approach. "For 15,000 people a day to be deported every day for two years is an undertaking that almost none of us could accomplish," Governor Christie said. But Christie and Carson, as well as other candidates, do agree that border security should be tightened. Carly Fiorina, who made a strong showing in the debate, assured voters that she had the skills to tackle immigration reform and a range of other issues. "We know what it takes to secure a border,” she said. “Money, manpower, technology...and the kind of leadership that understands how to get results." Behind the candidates’ podiums loomed Air Force One, the plane in which Ronald Reagan flew when he was president, from 1981 to 1989. The Reagan Library is the country’s largest presidential library, and Reagan remains extremely popular with many Republicans. Several of the candidates expressed how honored they felt to be in a place devoted to his memory. George Pataki, the former Governor of New York, said in the evening’s earlier debate: "When I think of Ronald Reagan, I think of his tremendous smile, a smile that reflected his optimism and his unending belief and faith in America and in Americans. That’s exactly the type of leadership we need in Washington today." U.S. voters are still evaluating the presidential candidates. Many are awaiting the first debate with Democratic candidates, which will take place soon, on October 13 in Nevada. Who do you think should be our next president? Why?